Art Asylum has announced that Diamond Select Toys will be releasing a 10th Anniversary “Best Of” series of Marvel Minimates Classics. 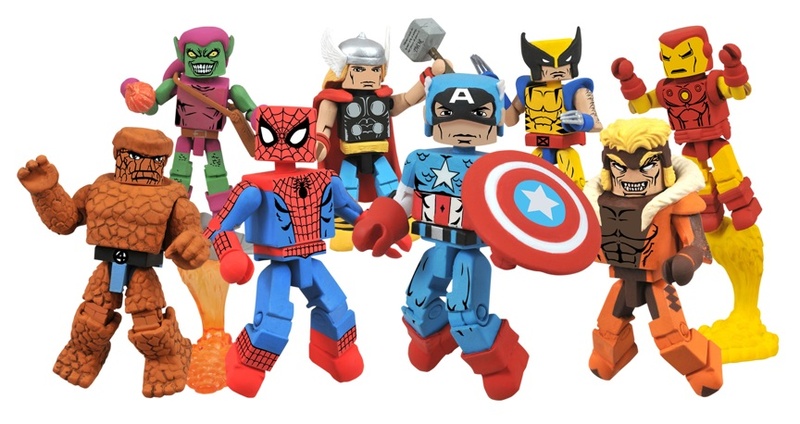 Marvel Minimates have been around for a decade, and Diamond Select Toys has made hundreds of different characters, but at the end of the day, everybody wants a Minimate of their favorite hero or villain, in the costume that they love best. 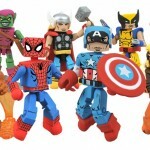 So for those of you just getting into Marvel Minimates, or simply looking for the essential version of a Marvel icon, DST presents a 10th Anniversary “Best of” wave of two-packs: Wolverine and Sabretooth, Spider-Man and Green Goblin (with glider), Captain America and Thor, and Iron Man and Thing. These timelessly comic-styled Minimates are a great jumping-on point for any collector or retailer, and they’re only being offered though Diamond Comics Distributors’ Previews catalog, which means they’ll hit your local comic shop, specialty store or online retailer this spring! Click the thumbnail for a bigger image. Neat, but I'm glad I'm out collecting these...For the price of these you can get an MU figure. That isn't a bad wave, however if you already collect Marvel Minimates you may already have these. Cool for new collectors, but I think I will pass. I do not want to go any further down that rabbit hole than I already am. I don't collect Marvel Minimates but, for the fans who wish to indulge it's a good starting point.